Experience the world without leaving your kitchen. The world is a fascinating place, filled with a diversity of colors, textures, and tastes guaranteed to stir your curiosity. But one thing common to almost everyone is the joy found in sitting down to share a bowl of warm soup or stew. The ultimate comfort food! 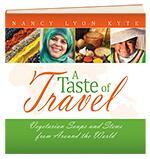 More than 130 recipes — both familiar and exotic — from Afghanistan to Zimbabwe. Click here to purchase as an eBook from the Amazon Kindle store for $9.99. Click here to purchase as an eBook from Barnes & Noble for $9.99.